[ARCHIVED THREAD] - Old Breakfree New Breakfree??? I have been shooting PPC for years. Cleaning my pistols and lubing them was a must after each session or competition. Been using Breakfree CLP for years. I also just ran out of my supply of Breakfree. After seeing a poster in here using small eye dropper bottles for lube I bought some. I also bought some new Breakfree. Some of my bottles have the old lube in them and some have the newer lube. Breakfree CLP is supposed to have Teflon in it, right? 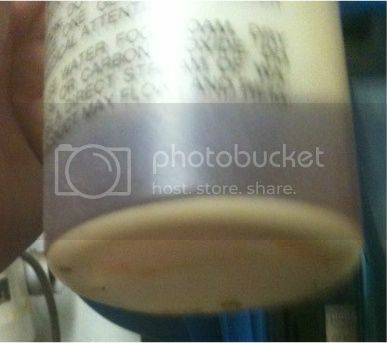 Well after some time as the lube settles, the Teflon settles to the bottom which you can see. The newer Breakfree, there is nothing on the bottom, and the liquid is much clearer. Bottle states Teflon is in there, but I think its not! Yes, I shook the hell out of the bottle before filling them. These two bottles have been setting here for over two months un-touched. You can see the bottle on the left, the Teflon has settled on the bottom. Where is nothing in the right bottle, the newer bottle I just bought. Old Breakfree on the left, newer on the right. Current break free is low to no solvent and you can't see the Teflon if it's even there. Royco 463 has solvent and Teflon if you can find it. Are those bottles spray bottles? Flip top or twist spout? Teflon comes in several forms. The old formula CLP Breakfree had Teflon in microscopic "ball bearings" that would settle. The new formula has Teflon in a different form that can't be seen. The old formula had to be shaken really well to mix the Teflon balls and the solvent. Too many people either didn't shake it at all or just gave it a quick shake or two. The Teflon wasn't being mixed so what you got was mostly solvent that didn't lubricate properly. The new formula also needs to be shaken but not nearly as much. They responded and said that the PTFE is still in there, but the particles are much smaller than the older stuff and hold suspended in the mixture better, for no settling at the bottom. Now you can take it for what it's worth (believe them or not), but I had asked that same question to them around 8 months or more ago. Gotcha. Thats not Breakfree at all but rather Royco, probably 463 or something earlier but not 634.
you're right, break-free, CLP, kleenex, etc. Count me a fan of the the new CLP formulation. I did not like the old stuff as much. The Teflon on the old stuff was always clogging up my needle oilers. If the old stuff had sat for a while you really had to shake it up in order to not have big chunks of Teflon floating around. I will admit the old stuff cleaned better but the new stuff isn't bad, and from what I understand less toxic. Either way though I'm a fan of CLP. you dont need teflon to be a great lube. Look at weapons shield for an excellent CLP type product. I posted this question on their Facebook page, here is their answer. Great question! The sediment seen in the container on the left is actually shaved particles of two different PFTE’s, also known as solid synthetics. As an industry, chemical manufacturers have transitioned to liq7uid synthetics which, as you can clearly see, stay suspended in the formulation. This ensures that both the high heat and the low temperature synthetics are well mixed in this formulation for better protection of your weapon systems. We hope this helps and we are glad to hear you are using our Breakfree CLP! Buy mine at walmart, it was like $7 a can. Thanks, I can see a few dollars more being a LGS but $22, that's way out of line. Next time I'm in there I am going to ask if they are confusing it with the larger spray pump bottle. Move to Slip2000 or another safe product. No need for the toxic crap to spray you in the face every shot. Use baby wipes to remove the bulk of the crud and hit it with a coat of Slip, fast easy safe. Clean your bore every 2-3k rounds with some break free foaming bore cleaner. FWIW I used a good amount of CLP starting from about 1996 throughout the years and if I recall correctly the older version seemed to clean a little better but was very runny. The Teflon (or at least that is what we were told it was) was quite obvious and required vigorous shaking of the bottle(s) before application. It was the issued CLP when I was in the USMC. The newer stuff is still good to go IMHO, seems to be thicker/more viscous but in my opinion a little less effective as a cleaner. I have since switched my primary CLP to another brand however, I have (4) 4oz bottles of good old Breakfree CLP put away in case I ever need it or want to go back. It is what it is. Keep calm, reload and squeeze the trigger. Regardless of weather it's the old or new version I would still use it. The teflon used these days is been refined and so the older version is just as good as long as you shake it up well. I remember the Breakfreeof the old days had a milky look too it once shaken up. Don't give it a sweat. Us it with confidence.